Investor Justin Hallett, 29, was looking to buy a low-maintenance rental property in North Queensland when he found a tidy two-bedroom unit in fair condition listed for $130,000. Having researched the market for three months, Justin realised the property was priced roughly $15,000 below similar properties in the area. When he received the contract, he noticed a small line on the body corporate disclosure statement noting that “repairs to roof” were required. “That made me a bit apprehensive, but I thought I’d investigate a little further to make sure I wasn’t turning down a good opportunity because of minor repairs,” Justin says. He ordered a building inspection prior to making an offer, and the results revealed so much damage to the unit block that Justin believes it’s virtually nearing demolition status. “The roof leak was affecting every property in the block – I found out it had been slated for repairs for two years, but some owners still hadn’t chipped in a special levy, so it was getting worse and worse,” Justin says. Justin says that when he withdrew his interest in the property based on the inspection, the vendor instantly offered a reduction of $20,000 if he was still interested. “I wouldn’t have bought it in a million years, it was just going to be a money pit,” Justin says. Illegal building: Up to $100,000. Cracking: Up to $50,000. Average $3,000. Internal walls patched and painted, external walls concealed behind plants or trellis. Damp: Up to $50,000 and $5,000 average. Walls painted or furniture placed against damaged walls. Termites, borers and timber rot: Up to $20,000. Average $5,000. Floor damage patched and concealed under carpets. Roof problems: Up to $20,000. Rusty metal roofs painted, tile roofs patched with lead. Damaged roof framing propped up in roof space. Rotten weatherboards and windows: Up to $10,000. Rot patched with filler or covered with tin and painted. Rotten sub-floor or stumps: $8,000 average. Floors temporarily propped to prevent bouncing. Faulty or illegal wiring: $6,000 average to repair. Faulty or illegal plumbing: $6,000 average to repair. Guttering and downpipes: $3,000 average. Rusty gutters patched and painted. Building and pest inspections can help safeguard property buyers against investing in fault-ridden properties, as the reports reveal the hidden problems a property may have. The results can give investors peace of mind, with the knowledge that what you’re buying is not going to collapse around you. A building inspector should examine all accessible parts of the building or property, including the interior and exterior of the building. All roof space, underfloor space, the roof exterior and the site of the property will be inspected. All the potential deal breakers like significant structural movement, major water penetration and considerable deterioration in building elements, including roofing, rendering and painting, will need to be identified, according to Rob Whelan, director of Advanced Building Inspections in Sydney. If you’re buying a property in an area where termites and pests have been a problem, a separate termite and pest inspection is highly recommended. “The beauty of getting an independent inspection is that it’s done coldly, dispassionately and by someone who is much more involved in the technical side of the property, rather than the emotional side,” Whelan says. An average combined building and pest inspection should take roughly 90 minutes onsite. While most investors understand how important it is to get a professional building inspection on their potential property investment, many find reading and interpreting the results difficult. Whelan says that there are many different types of reports available, from simple ‘tick the box’ style printouts to extensive, 20-page reports with substantial narrative. “There’s an Australian standard that specifies what should be included, at a minimum, in an inspection report, but different inspectors use different styles of reports, depending on how much you pay,” Whelan says. He adds that investors can expect to pay $200 for very basic inspections, through to more than $500 for extensive reports. Whelan recommends that purchasers request sample reports from potential building inspectors, so they can view their reporting style and ask questions upfront. “For people who are shopping around for an inspection, we always suggest they ask for a copy of a typical building report from each inspector, to understand if that report suits their needs,” Whelan says. He also says that a good inspector will discuss the results with the client in addition to supplying the written report. Most houses have got faults of some description; it’s just a matter of determining whether the property has minor flaws, or whether it is riddled with problems. Ron Tanton, Queensland state manager with national building inspectors Archicentre, says people often overlook the fact that a property can have hidden faults and problems that are potentially very dangerous. “Unhealthy mould or poor electrical wiring or a balustrade that moves away or rusting that causes structural integrity to be compromised – if [a property inspection] finds these types of problems, what we call ‘serious faults’, it’s a big danger signal,” Tanton says. Tanton says that property inspections can often reveal a property to be relatively trouble-free. According to Tanton, the following results from a building and pest inspection can indicate a serious problem with the property. “If you’re buying a property for investment purposes, you have to keep in mind that you have a duty of care to your tenants,” Tanton warns. Depending on the individual property, these problems can cost anything from a few thousand dollars to tens of thousands of dollars to rectify. Concrete cancer: This is the rusting of steel reinforcement inside concrete. As it rusts it expands and creates major structural problems due to ‘spalling’, where the concrete moves away from itself. This can allow water and moisture to seep in and cause further damage. “It can be very, very dangerous if the cancer is left to go,” Tanton says. Termite damage: People have heard the horror stories; even just exploring a property affected by termites to determine the extent of the damage can be expensive. Timber rot: Damp and other fungi, combined with a lack of ventilation, can result in extensive timber rot. Stumps: Rotting or even new, poorly installed stumps will need restumping, which can be an expensive structural problem. Frame damage: Regardless of whether frames are timber or metal, their condition can deteriorate and cause major structural issues. Water damage: This arises from drainage and plumbing issues. 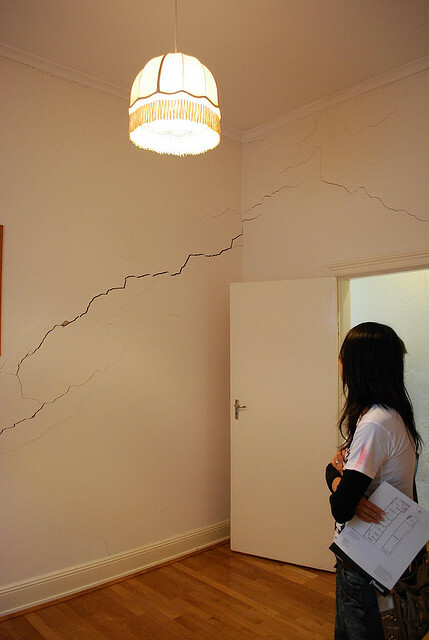 Cracking: Cracking can be the result of movement in the house and can signal major structural problems. Electrical wiring: Several homes have electrical problems that aren’t visible on the surface. Roofing: Not many people look at their roof on a regular basis, Tanton says, so a lot of damage can be uncovered in a building report. Hot water system: When a system nears the end of its life, it can cost up to a couple of thousand dollars for removal, replacement, electrical wiring and plumbing. Fungus: If identified, it’s highly likely to be mould, which can develop into a very unhealthy situation as it can cause respiratory problems.